Every once in a while I get an email from a fellow quilter that makes my day. Wednesday last week was one of those days. 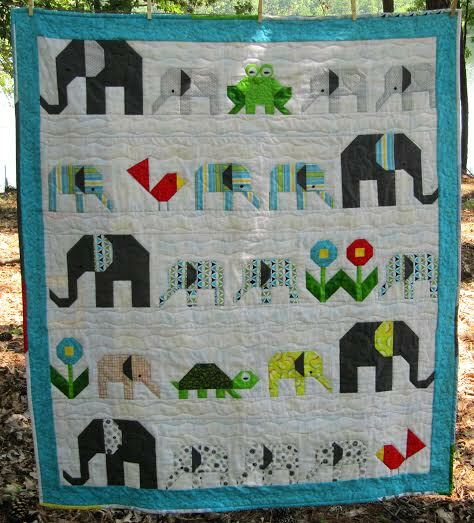 Donna Irmis of South Carolina sent me a lovely note and attached a couple photos of her finished Elephant Parade quilt. She made this quilt for her new great nephew. And what a sweet quilt this is! I love how the mama elephants ears share the same fabric used to make the baby elephants. And how cute is that happy, smiling frog?!! The blue border and scrappy binding frame this finish fabulously! Donna found the perfect backing fabric, too. All those colourful elephants parading along across the back to Beckett! What a lucky new baby boy.... and a very talented Great Aunt! Thanks so much for allowing me to share your gorgeous quilt will all our friends here on the Sew Fresh Quilts blog, Donna. Hugs from Canada to you in hot, hot, hot South Carolina! 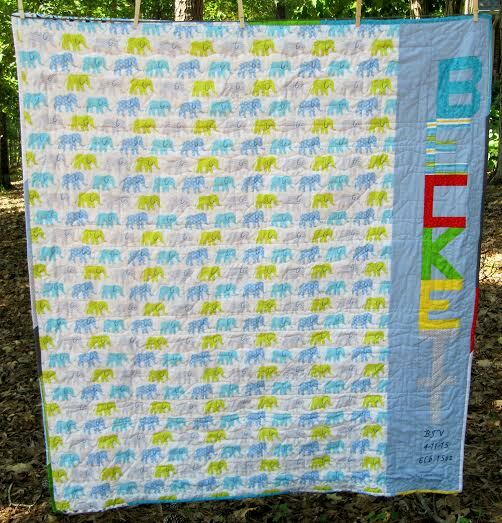 If any of you are interested in making your own Elephant Parade quilt, all the instructions can be found on the Elephant Parade quilt along page here. Dinkydoo Fabrics is a new online fabric shop and based in Vancouver, British Columbia. Alicia and her husband carry lots of pre-cuts, so all of you layer cake and jelly roll lovers will be happy, happy, happy! Featuring Moda, Cotton + Steel and much more! such as instagram, facebook, twitter and pinterest. Get 15% off your first order by signing up to their Newsletter. This little quilt makes me so happy! It was sure pretty quick to put together. Once I figured out how to piece those little bee blocks that is. I used my EQ7 program to work on this design and am so pleased with how much it looks like the EQ7 image. You can read more about that in this post. That's what I love about using the program. You can colour in your design using the fabric swatches of the prints you would like to use before even beginning to cut into that precious stash! The Bear and Bees finished at approximately 36" x 40" and is NOT paper pieced. In my opinion it is a gender neutral quilt and the perfect size for a new little baby. Maybe it leans a little more toward being a boyish quilt.... But. What am I most proud of? That this is my first finish using "prints only" in I don't know how long! Every one of these prints were purchased from Canadian National Fabric. The background is Ditsy Floral in Turquoise from the Theodore & Izzy collection by Andrea Turk from Cinnamon Joe Studio for Camelot Fabrics. The yellow in the bees, their blue wings, the bear's ear, nose and chest, and the honey pot were made from yellow, teal, pink and light grey Leaf Vine fabrics from the Bear Essentials 2 collection by P&B Textiles. The bear is made from White Mandorla from the Design Studio collection for Camelot Fabrics. The green grass is 63 Kiwi from the Juice collection by Ginger Lily Studio for African Sky. The backing is Theodore the Bear, also from the Theodore & Izzy collection and the binding is Black Gingham from the Country Touch collection by Daphne B. for Wilmington Prints. Those cute bears in the backing are simply adorable. And so are the bees. This backing fabric was my inspiration for the Bear and Bees design. The Black Gingham sure makes for a smart looking binding. But it causes your eyes go all bugged out when you are looking at it off the bolt. Working with the strips once they were cut was much easier to take! I used the Rita of Red Pepper Quilts binding method again. And am pretty happy with how it turned out. Here you can see that I used the organic wavy line quilting, so I could make my way around those appliqued letters on the honey pot. I just used plain white Gütermann thread for the whole works. Except the black applique on the HONEY. The Bear and Bees quilt was the 45th use of my 100 labels ordered from Ikaprint. 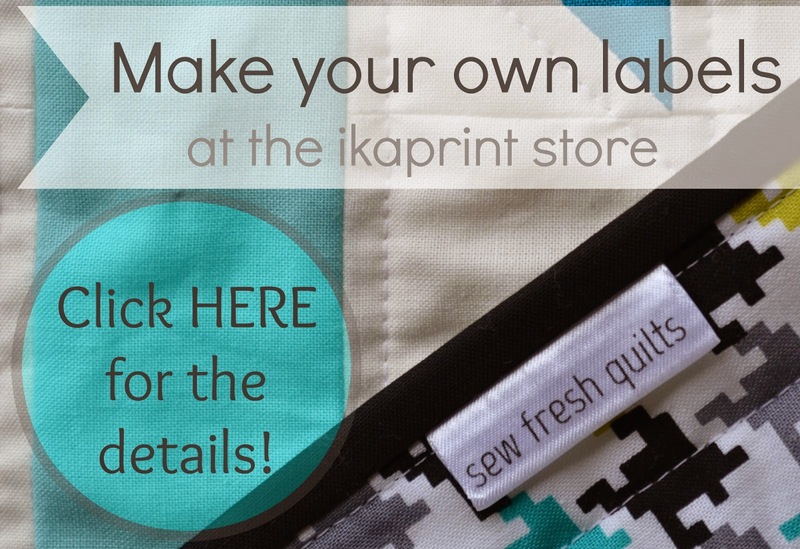 Did you enter the Ikaprint Label GIVEAWAY we have going on right now? If not, click here for your chance to win 100 labels now! 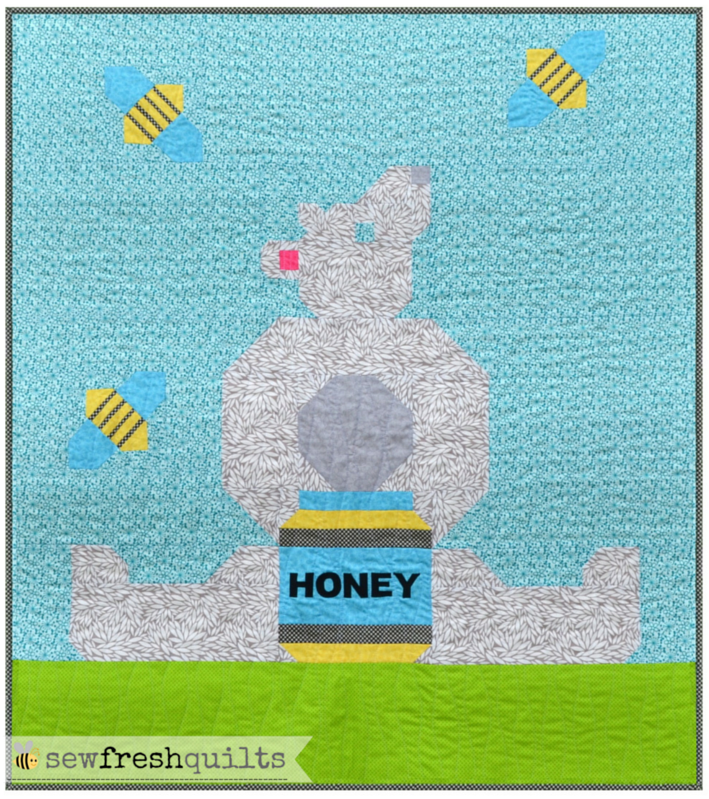 If you are interested in making your own version of the Bear and Bees quilt, the pattern has been added to my payhip pattern shop here. Welcome back friends! I can hardly believe another week has flown by and that it is Wednesday again already. Last week I showed two quilt tops. The Bear and Bees has been quilted and will be posted for my Friday Finish. The backing for the Elephant Parade quilt just arrived yesterday. Sew Fresh Quilts blogger bundle from Fabric Please! Meanwhile, Rita of Fabric Please! sent me this saturated bundle of loveliness. This is the Sew Fresh Quilts blogger bundle, which I will be sharing a tutorial for in August. You will get a chance to win your very own bundle in our giveaway. I can hardly wait! Aside from all the sewing and quilting, my daughter and I have been doing a little gardening. The dirt in front of our porch got a good digging up last fall. I planted the tulip bulbs that came up this spring. And this week Erin and I went shopping for a few flowers and some mulch. I used to do a lot of gardening when my kids were little, but I have been slacking off since I started quilting. It was sure an enjoyable day spent digging in the dirt with my girl. Do you bother to label them at all? How about totes and pouches? It was back in July of last year that I received my order of 100 quilt labels from the ikaprint store. It was in this post that I shared how much I loved my new labels and showed off how they looked on a newly finished GenX-Aztec quilt, for which I also shared a free tutorial on making that quilt. I used my 33rd label from that 100 label order when I finished my Zany ZebraZ quilt and had our first label giveaway. The Little Blooms in Kona finish brought me to a total of 44 labels used. These labels are made by Fatih Demirtas of IKA Products. Fatih is based in Paris, France. She make the most handsome and stylish bags and totes. And blogs about them here on her site. You see, I don't make the labels. I had been providing a storefront for ordering the labels from my site. But now Fatih is launching her updated site and all the labels will be ordered directly through her from now on. To celebrate, she has generously offered to sponsor a giveaway that includes 100 labels of your choice and includes the cost of shipping! and use the coupon code AFF05. Who wants to win a chance to Make Your Own Quilt Labels for FREE?!!! Use coupon code AFF05 for 5% discount and save! How do you enter the giveaway contest? Follow the instructions on the RaffleCopter.com widget below! Winner will be randomly chosen on July 27th and notified by email. Be sure to leave your email address on the Rafflecopter widget. Those batik strips are still getting sewn up. I had a great time playing around with some strips last Monday. And I guess I couldn't stop! This time I made a table runner out of some pretty blue and beige Island Batik strips. I am always drawn to those cool blues! The strips were each about 3" x 10". Some light. Some dark. But all rich and with such gorgeous designs. To finish this runner, I used my Bindingless Quilted Placemat Tutorial that I showed last week. For the topstitching and quilting I used Superior Threads' Bottom Line on top and in the bobbin. The finished measurement of this runner is approximately 9" x 37". The backing is made from a stash fabric that reminds me of a crackle paint job and is a Northcott blender called Textures #313. Using the bindingless method gives a sleek finish. It's a lot of fun. And it's quick!